Have a great time on a cruise Party on the Danube! Date & Time: May- October: Fridays & Saturdays at 23.00. Prices: 18 EUR/person, a welcome drink is included. E-ticket sent automatically in e-mail, after payment. The cruise lasts for 1,5 hour. The ticket includes a welcome drink on the ship, drinking games, possibility to dance, latest music to party. Meeting is at the ticket office of the Danube Palace/Duna Palota at 5., Zrínyi utca, V. district, Budapest 1051, at 22.30. Discover a whole new way of enjoying Budapest’s nightlife! 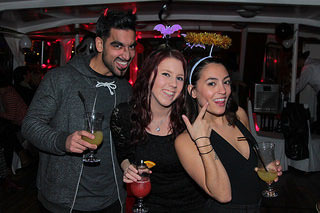 Combine a great party with an amazing night river cruise experience to make your night unforgettable, but hard to remember. Have a fantastic night out on a ship on the Danube. 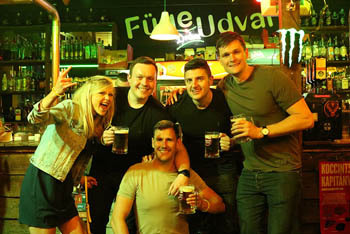 Enjoy a full bar, great music, dancing, party games and the starlit city scape of Budapest. After the cruise we will take you to one of the best clubs in the city to keep the party going. The ticket includes a welcome drink, a Hungarian specialty: poppy seed pálinka and you can buy more drinks (cocktails, soft drinks, beer, wine etc.) in the open bar at fair price. Snacks are also available. You can also admire the panorama from the open upper deck of the ship. The cruise lasts for 1,5 hour. We guarantee all the ingredients for an epic night! Price: 18 EUR/ person, a welcome drink is included. With Paypal: from your PayPal balance, or using a Bank Card, Credit Card. No need to create a PayPal account! After payment you automatically receive your E-Ticket. By booking the program you are agreeing to the terms and conditions.